(Natural News) According to a study, unlikely saviors can help clean polluted water sources and prevent the loss of valuable farm soil. Researchers from the University of Exeter have determined that beaver dams can help clean contaminated rivers. The semiaquatic rodents can also prevent the loss of nutrient-rich soil from fields thanks to the dams that they build. The scientists discovered that, thanks to one family of beavers, noteworthy levels of sediment, nitrogen, and phosphorus were removed from the water that flowed through their 2.5-hectare enclosure. The family of beavers, which lived in a fenced site at an undisclosed location in West Devon since 2011, built 13 dams that helped slow down the flow of water and formed several deep ponds through the course of what was originally a small stream. For the study, the researchers measured the amount of sediment suspended along with the phosphorus and nitrogen in water running into the site. They then compared the results to water that ran out of the site that passed through the beavers’ ponds and dams. The scientists also measured the amount of sediment, phosphorus, and nitrogen trapped by the dams in the ponds. The results revealed that the dams trapped more than 100 tonnes (110.23 tons) of sediment. At least 70 percent of the sediment was soil that eroded from “intensively managed grassland” fields upstream. Further analysis determined that the sediment had high concentrations of nitrogen and phosphorus. Both nutrients can harm wildlife in rivers and streams and must also be eliminated from human water supplies to maintain drinking-quality standards. Professor Brazier shared, “It is of serious concern that we observe such high rates of soil loss from agricultural land, which are well in excess of soil formation rates. However, we are heartened to discover that beaver dams can go a long way to mitigate this soil loss and also trap pollutants which lead to the degradation of our water bodies.” He posited that having more beaver dams can help provide various benefits for whole ecosystems, just like they do all over the world. Data from the study emphasized that the benefits of beaver dams on soil erosion losses and pollution in watercourses can help address the mounting concern over these issues. Devon Wildlife Trust has been conducting the enclosed beaver trial for seven years. The charity has also been managing a separate beaver project on a population of wild-living beavers on the River Otter, East Devon, since 2015. Peter Burgess, the charity’s Director of Conservation and Development, explained that the group’s partnership with Exeter University on both the fenced and unfenced beaver trials helped confirm that beavers can help take on a crucial role for both wildlife and possibly the future sustainability of the U.K.’s land and water. He noted that the results of “detailed scientific investigations” holds promise for soil and water quality in the nation. There are only two species of beaver. The American beaver (Castor canadensis), which usually weighs 60 pounds (lbs) (27 kilograms [kg]), and the Eurasian beavers (Castor fiber), which are about the same size. The latter often weighs from 29 to 77 lbs, with narrower tails and smaller skulls than the American beaver. 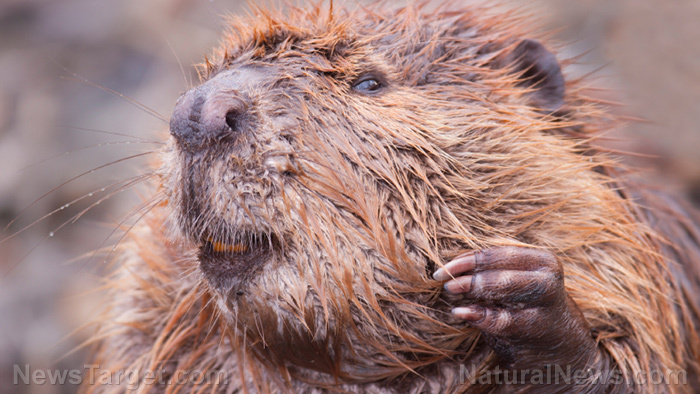 Beavers have large teeth, with upper incisors at least 20 to 25 millimeters (mm) long. They also live a semi-aquatic life with closable nostrils and ears and transparent eye membranes. Both male and female beavers have castors, or a pair of scent glands, at the base of their tails. The secretions from these glands, a musk-like substance known as castoreum, are used to mark their territory. Beavers live in lodges, or little dome-shaped houses made from grass, moss plastered with mud, and woven sticks. Lodges are built on various bodies of water, just above water level. Most beaver lodges have underwater back doors so the animals have instant swimming access. Read more articles on other studies about soil health at GreenLivingNews.com.